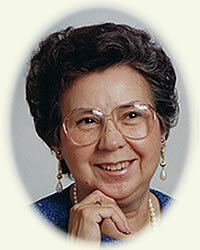 Obituary for Audrey S. LaRocca | Rhoney Funeral Home, Inc.
Audrey S. LaRocca of the Tuscarora Nation, passed away on Tuesday, April 2, 2019, in Northgate Health Care Facility under the care of Niagara Hospice. She was born on the Tuscarora Nation, on September 20, 1920, the daughter of the late Loveare and Cinderella [Williams] Printup. A member of the Bear Clan and the oldest member of the Tuscarora Nation. She attended Akron High School and graduated from Niagara Falls High School in 1939. Mrs. LaRocca was the selling manager at Hens & Kelly Department Store for many years before becoming the receptionist at the Turtle, she became the program aide for Green Thumb and was a member on their advisory board before retiring in 1994. She served as Commissioner of Human Right in Niagara Falls and was a member on the board of directors of Niagara Singles in 1976. An avid square dancer, she belonged to several dancing clubs and was the coordinator of the Rainbow Squares. She was the wife of the late Vernon Dougherty, Edward Ehrhard and Earl LaRocca. She was the mother of the late Donna (late Grant) Badendyck and Kenneth A. Dougherty and sister of the late Minerva, Eleanor, Alberta, Arnold, Loverne and Herbert. Mrs. LaRocca is survived by her daughter-in-law Eileen Dougherty, five grandchildren Timothy (Jennifer) Badendyck, Kelly (Gordy) Marsh, Jennifer Cheers, Lisa (Bud) Crogan and Kenny Dougherty, eight great grandchildren, a niece Mary (Byron) Scouten, she is also survived by many great nieces and nephews. Her family will be present on Thursday from 4-8 PM at the RHONEY FUNERAL HOME, 5893 Hoover Road, SANBORN, NY, where funeral services will be held on Friday at 11:00 AM, with the Rev. Donald A. Robinson, Jr. officiating.